Dr. Grace Kemp primarily grew up near a small town in southern Ohio’s Highland County. However, Dr. Kemp also lived in Maine and Oklahoma until her family moved back to Ohio when she was 8 years old. It was in Oklahoma where Dr. Kemp met her first pet, a beloved gerbil named Ariel. Dr. Kemp has had a fascination and love for animals for as long as she can remember and she knew she wanted to be a vet at a young age. Taking steps to achieve her goal, she participated in many animal projects through 4-H including sheep, rabbits, cats, pocket pets, and veterinary medicine. She attended Southern State Community College as a high school senior, and graduated Valedictorian from Whiteoak High School in 2001. She attended The Ohio State University (OSU), graduating with a Bachelors of Agriculture with a major in Animal Sciences. During undergrad she enjoyed working as a research assistant in the OSU dairy cattle nutrition laboratory. Dr. Kemp’s adventurous nature took her to Australia for study abroad, where the studies focused on animal welfare and production. She also took a class in college that allowed her to go skydiving once. Dr. Kemp also attended veterinary school at OSU and graduated in 2009. Her first position as a veterinarian was in mixed animal practice where she worked for about 3½ years. She enjoyed working on cats, dogs, cows, horses, sheep, goats, alpacas, and the occasional pig, but decided to focus on the small animal aspect of medicine. As such, she and her husband moved to the Cambridge area where she has held a position practicing exclusively small animal medicine for the last 3½ years. 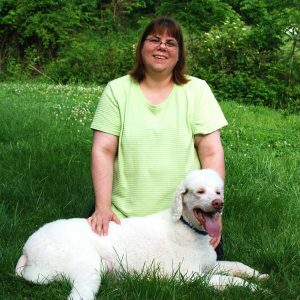 After several years in practice, she decided that she would like to have a place to call her own, and together with her husband, started Goodworks Veterinary Hospital in September 2016. Dr. Kemp and her husband Joel currently live outside of Cumberland, but plan to move to the St. Clairsville area soon. Joel and Grace have three dogs. They have a Golden Retriever named Buckeye, a Lab/Chow mix named Kenya, and a Beagle named Fern. They also have two cats named Steel and Sling. All three dogs and one cat were adopted through the various veterinary clinics in which they both worked through the years. Steel was a stray that wandered onto a family member’s property. In her free time Dr. Kemp enjoys spending time with her family, especially having cookouts and campfires. 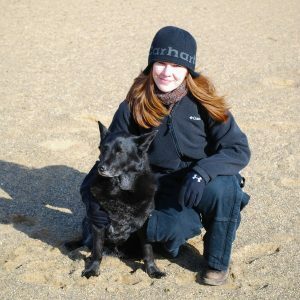 As a veterinarian, her goal is to provide the most thorough and compassionate care possible to all of her patients. Joel grew up on a small farm near Belmont where he and his dad raised dairy replacement heifers, some feeder calves, and other livestock. Joel also grew up in the veterinary world. His dad, Dr. Harold Kemp, is a local veterinarian. Joel graduated from Union Local High School in 2001. After high school, Joel attended and graduated from The Ohio State University (OSU). He was educated as an animal scientist with an emphasis on dairy and life sciences. During college, Joel worked in a variety of agricultural and veterinary related positions including the OSU dairy nutrition lab, The OSU Veterinary Hospital (in the large animal section), a progressive small animal hospital, and The OSU Waterman Dairy Farm. During some of that time, Joel lived on the OSU Waterman Dairy Farm and served as a student manager. Before starting his current career, Joel served as Intern with the veterinary department at Select Sires, which handled the veterinary care for hundreds of breeding bulls. In addition to managing the vet practice, Joel currently works for and with several government agencies in areas related to regulatory veterinary medicine and animal health. As such, Joel has the opportunity to work with and learn from veterinarians and agricultural leaders throughout the state on a routine basis. Joel enjoys outdoor activities, especially the shooting sports. 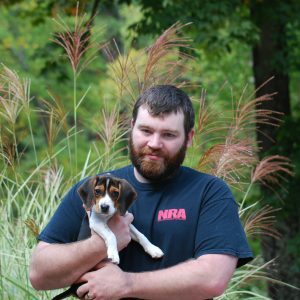 Joel is a certified firearms instructor and occasionally teaches classes. Joel also enjoys doing some basic gunsmith work. Most of all, Joel likes spending time with his wife and when possible family and a great group of good friends. Joel and Grace have three dogs. They have a Golden Retriever named Buckeye, a Lab/Chow mix named Kenya, and a Beagle named Fern. They also have two cats named Steel and Sling. All three dogs and one cat were adopted through the various veterinary clinics in which they both worked through the years. Steel was a stray that wondered onto a family member’s property. Jed grew up on a small farm in Port Washington Ohio. He attended Indian Valley High School and during his senior year he was named “Best Brave” for his academic and extracurricular achievements. After high school, Jed worked in manufacturing for several years. During that time Jed met his wife Amanda and in 2009 they got married in Las Vegas. Growing up on a farm, Jed has always enjoyed working with animals, but didn’t plan to become a veterinary technician. He actually just happened upon an advertisement for the veterinary technician program and knew right away that is what he wanted to do for a career. 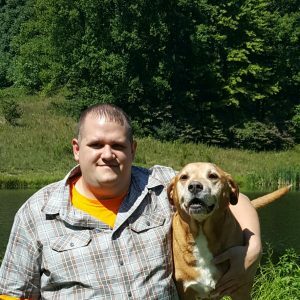 Jed attended Kent State University and became a Registered Veterinary Technician after he graduated in 2014 with a degree in Applied Science for Veterinary Technology. During his time at Kent State, he also worked at the Tuscarawas County Humane Society Cat Shelter. As a technician, Jed is especially interested in veterinary dentistry, nutrition and hematology, but his favorite part of the job is meeting all the unique animals and people. Jed and his wife still reside in Port Washington with their 6 dogs and 9 cats. Outside of work, Jed enjoys spending time with family camping, hiking, fishing and playing video games. He also enjoys professional football, wrestling, and politics. Megan graduated from the University of Findlay in 2011 with degrees in Animal Science and Biology. She graduated from the Brown Mackie Veterinary Technician program in 2015. 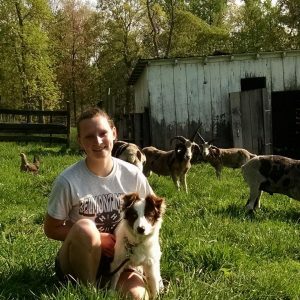 She has been involved in the veterinary field since she was 16 years old, shadowing large and small animal veterinarians and even had an internship at the Ohio Wildlife Center in Columbus. She has one “coconut retriever” dog named Joey that she rescued from the island of St. Kitts. In her spare time, she likes to foster animals, crochet, and cross-stitch. 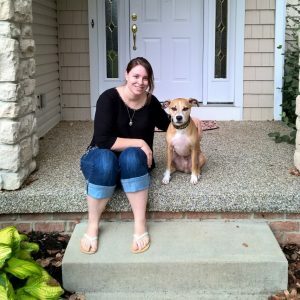 She recently moved to the area from Canton, Ohio and is excited to get to know her new home. Teresa is a graduate of Meadowbrook High School in Byesville, Ohio. In 2001, she completed a dog grooming course at Diamond Cut Dog Grooming School in Medina, Ohio and was certified as a professional groomer. She currently resides in Buffalo, Ohio with her six dogs, two cats, and a ferret. On her days off from the hospital, Teresa also runs a dog grooming business out of her home. Teresa has wanted to work with animals for as long as she can remember and has worked as a veterinary assistant since 2008. In her spare time, she enjoys reading and spending time with her furry family. Dorothy grew up in Belmont, where her family has a small farm with sheep and cattle. Dorothy has always had a love for animals and an eagerness to learn more about them. She was very active in 4-H and FFA throughout high school. She showed sheep and cattle at the county fair, and received her State FFA Degree in 2012. She graduated from Union Local High School in 2012, and from The Ohio State University with a degree in Animal Science and from Columbus State’s Veterinary Technology program in 2017. Dorothy enjoys gardening, hiking, reading, and spending time with her nieces and nephew. She has a border collie named Bandit as well as three cats, Dempsy, Arabella, and Popple. Dr. Kemp is courteous, professional, personable, and just all around wonderful. She made us feel that we were part of our dogs’ care and treatment plans. She patiently listened to our concerns, prepared a treatment plan, explained the plan and fees to us, and followed up with a phone call afterwards. She takes her time with our dogs, never rushing, and always speaks to us in a way so that we understand what is going on. Our two dogs are always excited to see her. Dr. Kemp loves our dogs like we do, and provides care to ensure that they live long and happy lives. On May 8th, 2015 Harley was rushed to the veterinary clinic where Dr. Kemp had been working. Harley had not been acting his usual self when we arrived home. Dr. Kemp was quickly contacted and told us to bring him in ASAP. Upon arriving at the clinic, she immediately took action to see what was going on. An intestinal obstruction was determined to be the issue but the extent of the condition wouldn’t be known until emergency exploratory surgery was done. removed in order to try and save his life. Nothing in life is ever guaranteed and we’re only given a short time with those we love, but upon spending ten very long days in the very caring hands of Dr. Grace Kemp, Harley was able to return home to his family. He is doing wonderfully today and is enjoying his golden years with those who love him the most. Without the compassionate and dedicated care of Dr. Kemp we’re unsure of how our journey may have ended. We will forever be grateful for the exceptional care she had shown us and for her blessing us with the gift of time!